This post is part of an ongoing monthly blog series dedicated to the California Employment Development Department (EDD) monthly employment release. Click images to enlarge in a new tab/window. The California Employment Development Department (EDD) released statewide county employment data today for the May 2014 period. San Diego's unemployment rate continued to decline from April to May, with the rate now down to 5.8 percent, the lowest it has been since May 2008. Unlike the major decline in April (read the full report here), the decline in May came without a drop in the region's labor force. 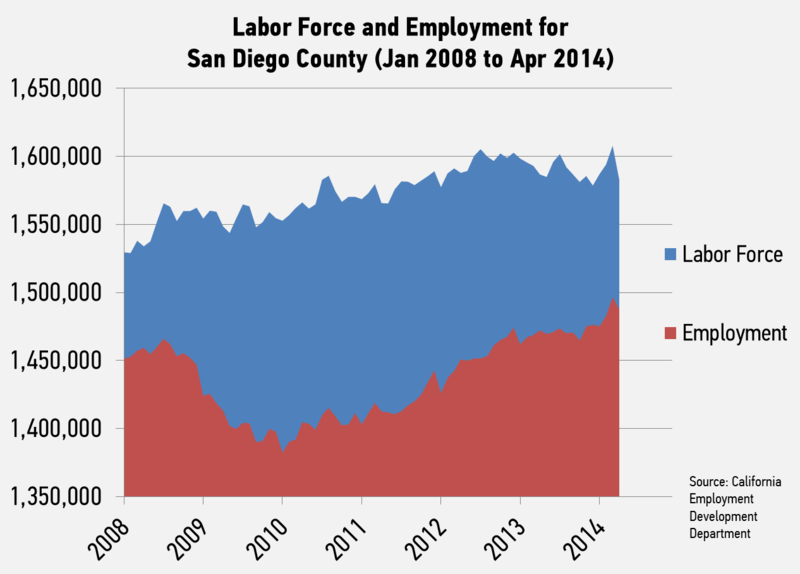 From April to May, 3,000 joined San Diego's labor force, while the region experience a 3,800 person drop in civilian unemployment. Where last month's unemployment rate free fall was somewhat alarming, this month's decline appears to be a good sign for the economy. 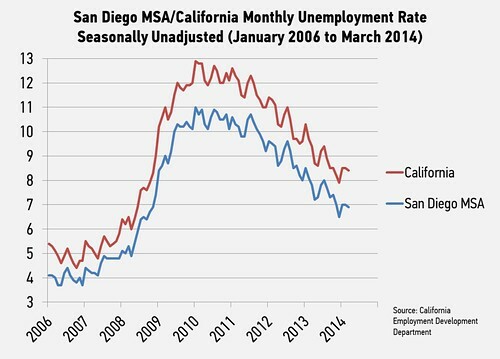 The region's unemployment rate is now below the national rate and remains well below the California rate. The region added 5,100 jobs from April to May, 4,800 of which were in the private sector, which is another healthy sign for steady economic growth. Potentially more noteworthy, the region's economy added 29,300 jobs from May 2013 to May 2014, a 2.2 percent increase. The region's private sector grew by 2.5 percent from May 2013 to May 2014, a number roughly in the middle of expectations of the region's leading economists. As of May 2014, the region had 1,342,700 non-farm jobs, more than 82 percent of which were in the private sector. 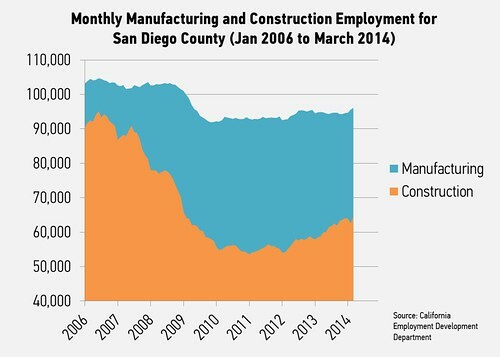 San Diego's goods producing industries continued their steady employment growth. Construction was up more than 1.5 percent from April to May, adding 1,000 jobs to the region. From May 2013 to May 2014, the construction industry has added 5,100 jobs, an 8.5 percent increase. Manufacturing growth has been a bit slower, but still steadily increasing, which is a great sign for the industry. From April to May, the manufacturing industry added 100 jobs. The industry added 1,700 jobs from May 2013 to May 2014. As the region ramps up for summer tourism and convention season, the leisure and hospitality industry led most of the growth from April to May, adding 3,900 jobs to the economy, as expected. The industry was also up 3.7 percent from May 2013. Most of this month's growth came from the region's food services and drinking places. Health care and social assistance was the only other significant job creating industry from April to May, adding 1,000 jobs over the month period. The professional, scientific and technical services sector dropped by 700 jobs from April to May, but these monthly ebbs and flows are common in the industry, and we expect the industry to grow in the near future. 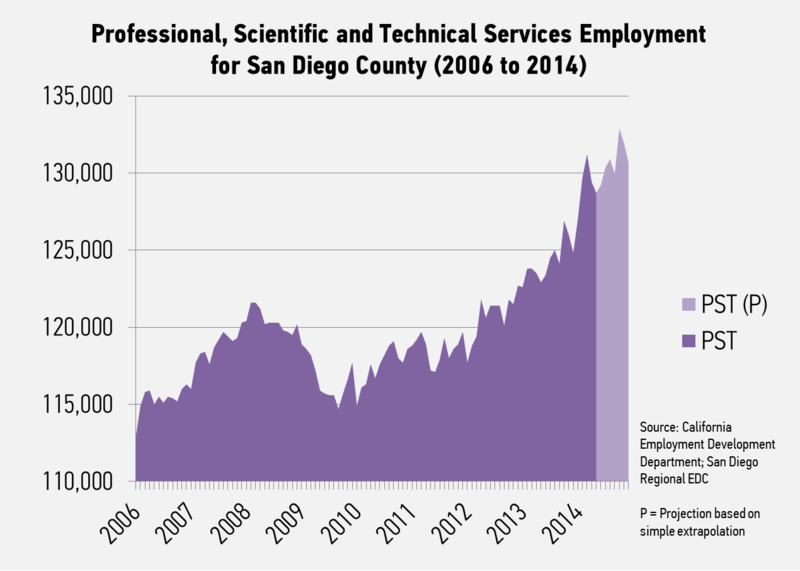 From May 2013 to May 2014, the sector added 5,800 jobs, a 4.7 percent increase, which is among the highest growth sectors in San Diego over that period. Other significant growth sectors over the annual period include scientific research and development services sector and the region's retail and wholesale trade sectors. The former added 1,400 jobs while the latter combined to add 3,500 jobs. While this month's job growth was led by only a few sectors, it's important to note that most key industries have grown steadily from the previous year. Additionally, the sectors that drove the employment growth this month are either from our traded economies, like tourism, or are leading indicators for strong economic growth, like construction and manufacturing. It is also positive to see the region's unemployment rate continue to fall while adding people to the labor force. This post is part of an ongoing monthly blog series dedicated to the California Employment Development Department (EDD) monthly employment release. The California Employment Development Department (EDD) released statewide county employment data today for the April 2014 period. 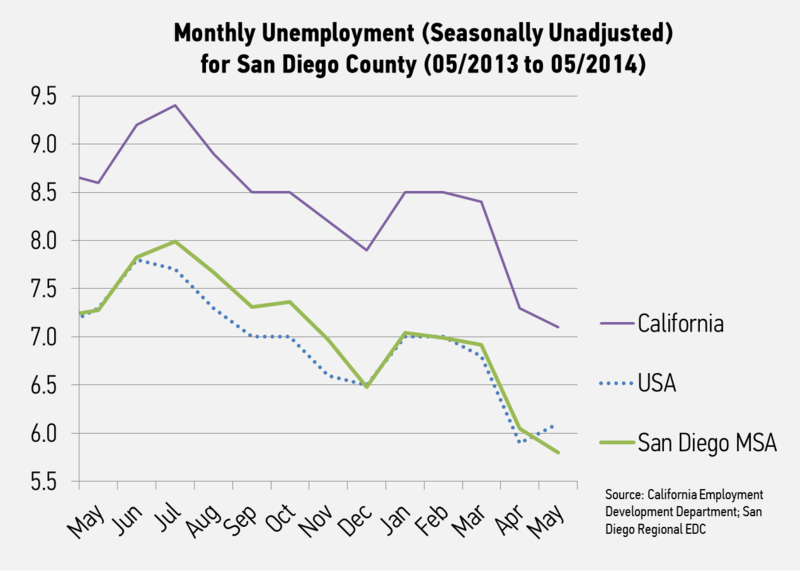 The big headline in this month’s report is that San Diego County's unemployment rate has dropped nearly a full percentage point, down to 6.0 percent from 6.9 percent in March 2014 and 7.2 percent in April 2013. While this number appears encouraging, it is also noteworthy that the labor force lost 25,000 workers. This is the single largest month-to-month drop in the labor force on record (since 2000), and the lowest the labor force has been since October 2011. Meanwhile, the economy added 2,900 nonfarm jobs from March to April, which makes this month's report particularly perplexing. There are several possible explanations for this drastic decline in the labor force. First and most commonly, many long-term unemployed have simply given up looking for work or found work outside of the San Diego region. This most likely explains the 16,000 unemployed who exited the labor force. There may also have been less people who decided to enter the labor force, possibly out of lack of confidence in employment opportunities or lack of relevant skills. However, we also saw 9,000 employed persons leave the labor force, presumably because of a combination of retirements, seasonal exits and moves to other regions. It is not uncommon to see the labor force seasonally decline from March to April, just not to this magnitude. It appears contradictory that despite this massive labor force decline, the economy actually added jobs. It is worth noting that from February to March, the economy added 12,400 jobs while the labor force lost 11,200 workers. This is likely due to a discrepancy in the surveying, since labor force numbers come from household surveys and job numbers come from surveys of businesses. It is also possible that those who were employed found second jobs. The result is likely a mix of all of these factors, which leaves us with an unusual report for April. As noted, the economy added 2,900 jobs total from March to April 2014. The private sector outperformed by adding 3,400 jobs in the month, with government job decline accounting for the 500 less jobs. Service providing industries added most of the jobs, while we saw job losses from the goods producing industries like construction and manufacturing. The job picture looks even more promising when compared to last year. From April 2013 to April 2014, the economy added 29,000 jobs, a 2.2 percent increase. The private sector added 26,600 jobs over the year and we saw positive growth in the manufacturing and construction industries, which added 1,100 and 4,300 jobs, respectively. The 4,300 construction jobs added constitutes a 7.2 percent increase over the year. We also saw growth in our important traded economies, with leisure and hospitality adding 4,300 jobs and professional, scientific and technical services adding 6,200 jobs. We will likely need to wait until future job reports to determine if this unusual report is an anomaly or an indication of larger trends. Historically, we have seen the labor force continue to decline or remain relatively flat from April to May, but with the recent major change in labor force amidst job creation, we may see people coming back to the labor force in the coming months. Our Economic Indicators Dashboard will show how this compares to other US metros and the US total rate when that information is released in the coming weeks. This is the inaugural post of an ongoing monthly blog series dedicated to the California Employment Development Department (EDD) monthly employment release. The California Employment Development Department (EDD)released statewide county employment data on Friday for the March 2014 period. 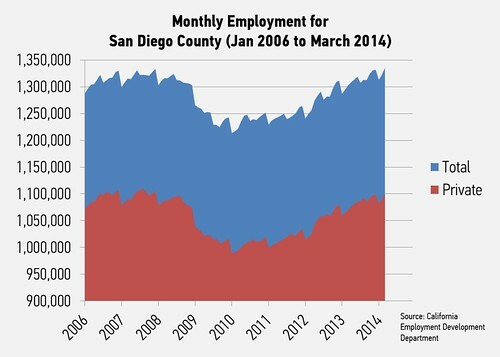 The biggest news coming out of this month’s report is that San Diego County has finally exceeded its historical seasonally unadjusted employment peak set in December 2007. EDD reported that the region now has 1,335,200 non-farm jobs as of March 2014, exceeding the previous peak of 1,333,400 jobs. Economists expected employment to rebound above its pre-recession peak sometime in 2014, and it is encouraging to exceed that mark as early as March. Private employment, which was reported at 1,100,300 jobs, has yet to exceed its peak of 1,110,100 set in August 2007. However, March 2014 private employment was the second highest ever recorded. The region added 30,100 private industry jobs from March 2013 to March 2014, with 10,600 of those jobs being added from February to March 2014. 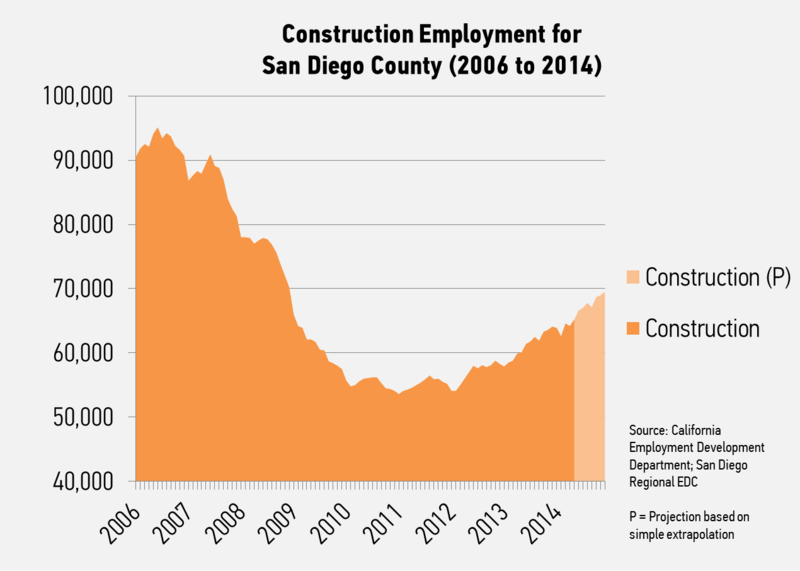 San Diego’s construction and manufacturing industries continue to pick up steam as the economy rebounds from the recession. The construction industry added 2,000 jobs from February to March 2014, and added 5,800 jobs from March 2013 to March 2014. While manufacturing growth was more modest, the industry added 500 jobs from February to March and added 1,200 jobs from the previous year. Professional and business services added 6,500 jobs from March 2013 to March 2014, the most of any industry in the region. Professional and business services includes much of the innovation economy activity, along with critical service providers like legal services, architecture services and enterprise management. 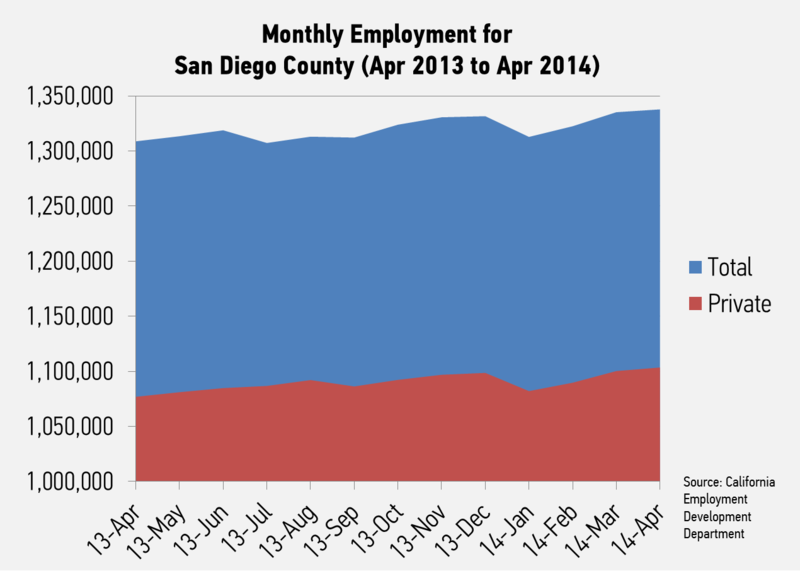 It is also the largest industry in San Diego, employing more than 228,000 as of March 2014. San Diego’s leisure and hospitality industry, otherwise known as tourism, added 6,100 jobs from March 2013 to March 2014, with 3,400 of those jobs added from February to March 2014. Both of these industries had already exceeded their pre-recession peaks in 2013. The county’s seasonally unadjusted unemployment rate dropped to 6.9 percent in March 2014, down from 7.0 percent in February 2014 and 7.8 percent in March 2013. California’s statewide unemployment rate was 8.4 percent in March 2014, well above San Diego’s posted rate. Our Economic Indicators Dashboard will show how this compares to other US metros and the US total rate when that information is released in the coming weeks.